Devon and Lexi (the Chalk Twins) both received majors in studio art and studied a wide variety of art media through the University of Georgia program in Cortona, Italy. In addition to their formal study in art, Devon and Lexi have enjoyed tremendous success as chalk artists. For the past ten years they have been participating in chalk art competitions throughout the East coast where they have been awarded in 15 out of 19 events. They now bring their chalking skills to conventions and special events around the country. Their live chart art performances have been featured at several shows including Dragon*Con, MegaCon and Anime Expo. Sidewalk chalk is a performing art. Devon and Lexi are there to interact with people - so don't be afraid to talk to them while they're working. 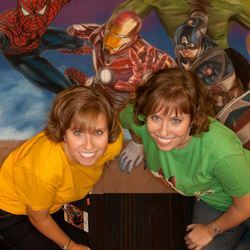 They'll answer your questions and talk about twin stuff, anime or art - all while the artwork comes alive at their feet. Their live performances at anime conventions are re-creations of everyone's favorite characters and heroes usually 25 to 100 square feet in size that come to life over the two, three or four days of the show.